These past few weeks I’ve immersed myself in alternate universes: Fringe, which I’m re-watching, and The Gilmore Girls, which is brand-new to me. One of the things that amuses me about the latter is Lorelei’s stream-of-consciousness/beat-like patter; another is Rory’s friend Lane’s music obsession. In between watching those shows, well, there’ve been the usual suspects: Covert Affairs, Homeland, The Big Bang Theory and Once Upon a Time, plus the occasional Law & Order rerun. There’s also been plenty of music. It’s an audiophile’s version of an iPod, essentially. Now, some audiophiles will tell you that, long before the shift to MP3s and AACs, digital distilled the warmth out of music. I disagree. A well-mastered CD sounds as good to my ears as vinyl ever did. Natalie Merchant’s self-titled album from this year is a good example. The sound is warm and spacious – phenomenal, actually. But in the early days of CDs, an assortment of variables iced the sound – not all the time, mind you, but often enough. The use of production masters meant for vinyl, for one, resulted in what might best be called “mimeographed audio.” The music was faint, thin and flat, not full and well-rounded. Another variable: nth-generation masters, which – just like nth-generation cassette copies – sported degraded sound. There are also stories (and they may well be urban legends) of record companies, in those early years, of using cassettes as the source for some CDs in their mad rush to get product out the door. To shift gears for a second: Store-bought MP3s and AACs are generally encoded at 256kbps. That a CD is 1411kbps, consumers are told (often by one another), is beside the point. Compression algorithms ensure that we’ll hear a faithful representation of the source material. So an MP3 or AAC of a subpar track is going to sound equally lousy. Conversely, a great-sounding CD that’s been encoded into MP3s or AAC will, in many instances, sound “good enough.” Almost everyone multitasks these days, after all, and for many people the music is pushed to the background when doing so. I see it in my office, where many folks, including me, often have headphones on while focused on their work; and, at least with me, I’m often so focused that I don’t even hear the music. But for serious listening “good enough” isn’t good enough. FLAC and the Apple lossless equivalent, ALAC, have always been the way to go. Until now. In an A-B test pitting the PonoPlayer against my iPhone 5, using my mid-tier Logitech desktop computer speakers and standard-def FLAC and ALAC (Apple Lossless) files of Rumer’s “Dangerous,” “Sam” and “I Am Blessed” (from her new Into Colour album), Pono delivered a wider and deeper soundscape. The music is more visceral, immediate and – dare I say it? – warm; and her luscious vocals are whipped-cream rich. The same’s true when listening with my mid-tier Bose headphones. That’s due, no doubt, to the Pono’s singular focus on audio; unlike a smart phone, it need not be all things to all people. A quick comparison to my MacBook Pro with the same files, however, reveals a negligible difference. If I wasn’t the one hitting stop and start, I likely wouldn’t have known which was which. Where the Pono has the edge: Its ability to handle high-resolution audio. That means 24 bit and up to 192kHz vs. the iPhone’s CD-quality 16 bit/44.1kHz limitation and the MacBook’s native 24 bit/96kHz support. Theoretically speaking, the high-resolution files should be akin to the original studio masters, with no limits on the highs or lows, and no compression. It’s been said (and proven) that humans can’t hear all the additional frequencies included in high-resolution tracks, and I am one who believes in science. But there is a difference. The deluxe Paul McCartney reissues, which I’ve religiously purchased since they began in 2010, come with 24 bit, 96kHz “unlimited” downloads in addition to the physical CDs. The opening tracks of the high-res Venus & Mars reveals a slightly richer, well-rounded sound – that’s evident via listening on my MacBook, but on the PonoPlayer they sound even better. 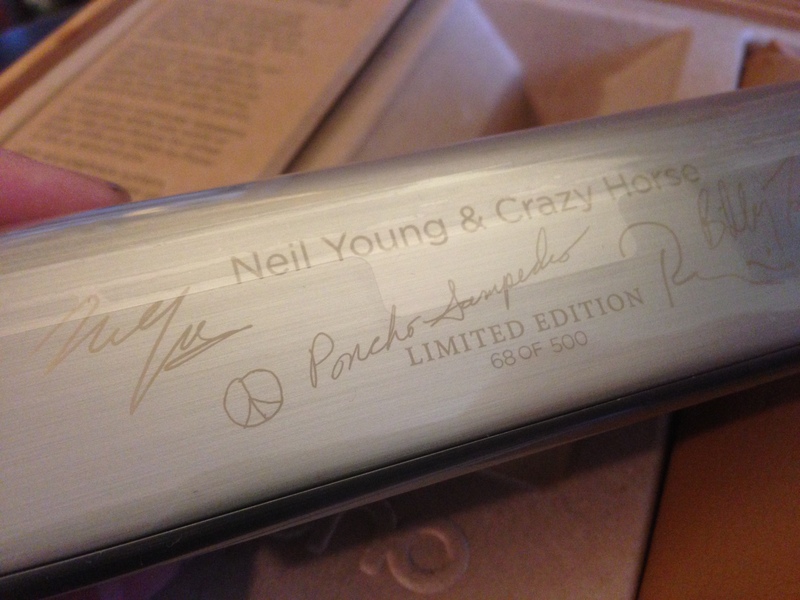 And the same result is had when comparing the 24 bit, 192kHz version of Neil Young & Crazy Horse’s Psychedelic Pill, which came with the player, to my Apple Lossless version. Comparing the high-resolution tracks to MP3s of the same source material, however, is akin to comparing day to night. Joni Mitchell’s Blue is a sheer revelation; you hear the vibrato of the plucked guitar strings. It’s magical. And Dusty Springfield’s classic Dusty in Memphis conjures the smell of new vinyl. At present, the biggest issue I’ve had hasn’t been the player or its sound, but the PonoMusic ecosystem. The software is somewhat clunky, especially for one coming from iTunes or Windows Media Player; and the store, though well stocked of standard-resolution content, lacks much of the same high-resolution material that can be had elsewhere (HDTracks.com) – and is a tad overpriced. I expect both to change in the coming months, however, as more people sign on. Oh, and one more thing: Everybody Knows This Is Nowhere rocks. It’s the best version of that classic (one of my Top 10 albums of all time) I’ve ever heard. great write-up. 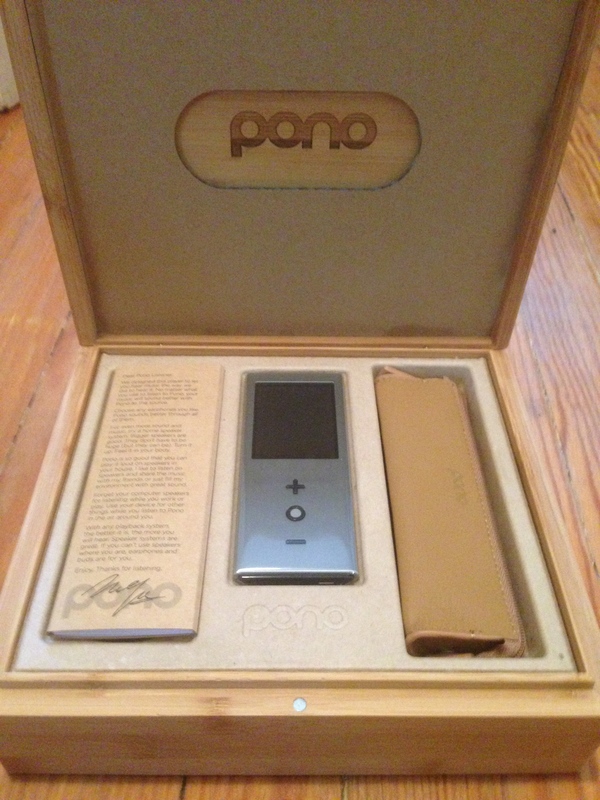 my pono player should show up today and i’ll be doing a similar review at wfnk.com. this focuses on extremes in the frequency range (highs and lows) and indeed, most of us can’t hear pure sound in those ranges. but we do hear what those sounds do to other sounds within our range of hearing. hearing isn’t additive as much as its subtractive, and additional high or low frequencies in the masters affect all other frequencies. there is also something called “timbre” that doesn’t show up on any waveform and seems to be more accurate at 24/48 or higher. basically, music is not a test tone, and any filtering or removing of signal can affect other parts of the signal. chopping highs and lows to throw out data should only be done by the studio, not the delivery format. also, i think our language and descriptions usually miss the target when it comes to sound quality and accuracy, because we focus on total range. if i buy music i want the instrument or voice to sound exactly as the artist/mixer/producer/mastering engineer wanted it to sound. downsampling, compression, or other consumer filters alter the quality of the sound to my ears. CD’s do sound better now than in 1984 but 16/44 is still a pointless restriction. pros have been recording at 24bit for a decade at least and even bedroom producers have been for a few years now. i hope you enjoy your pono player. i’ve read there’s a burn in period for some of the electronics so it should show an improvement in sound after 50+ hours of jamming.